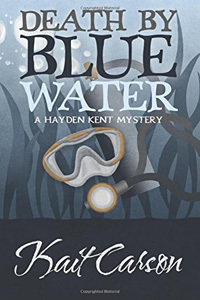 Death by Blue Water by Kait Carson: Synopsis and Online Purchase Options. Synopsis (from the publisher): Paralegal Hayden Kent knows first-hand that life in the Florida Keys can change from perfect to perilous in a heartbeat. When she discovers a man's body at 120' beneath the sea, she thinks she is witness to a tragic accident. She becomes the prime suspect when the victim is revealed to be the brother of the man who recently jilted her, and she has no alibi. A migraine stole Hayden's memory of the night of the death. As the evidence mounts, she joins forces with Officer Janice Kirby. Together the two women follow the clues that uncover criminal activities at the highest levels and put Hayden's life in jeopardy while she fights to stay free.